Dungeons & Dragons loves the amazing video streams produced by our fans. This community-generated live-play highlights what’s fantastic about D&D—sitting down together with your friends to tell a grand story! To celebrate, we’ve invited a bunch of D&D streamers and luminaries to Seattle, Washington to hang out and roll some dice on June 2nd and 3rd! 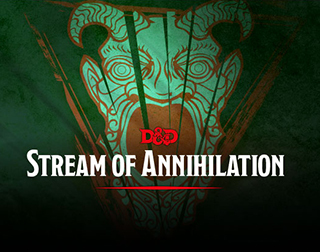 This two-day event is called the Stream of Annihilation and it’s two full days of streaming that D&D fans won’t want to miss. We’ll have folks from Acquisitions Incorporated: The "C" Team, Misscliks, Maze Arcana, Critical Role, and Dice, Camera, Action! with Chris Perkins, not to mention international gaming groups like Yogscast's HighRollers (U.K.) and Dragon Friends (Australia). Kicking off at 10am on both June 2nd and 3rd, hosts Anna Prosser Robinson and Kelly Link will talk to the Wizards of the Coast D&D team and learn all about our next exciting storyline coming in September. Then each group of streamers will play or share a sample of what to expect from the campaigns they’ll be running over the summer that preview the new D&D story. There will be multiple live games, interviews, new product unveils and improvised hilarity each day, starting at 10am PT and ending at 10pm each night. You’ll get introduced to the High Rollers crew delving into uncharted territory DMed by Mark Hulmes, a new Misscliks show investigating rumors called Risen, two weekly groups from our friends Satine Phoenix and Ruty Rutenberg at Maze Arcana, a new group of L.A. actors called Girls Guts Glory, and more! Throughout the Stream of Annihilation, we’ll drop details on our expanded D&D Twitch programming, new accessories fans have been clamoring for coming later this year, and amazing board games and products from our partners. You’ll hear from Cryptic Studios about plans for Neverwinter, Curse Media for D&D Beyond, as well as WizKids, Gale Force 9, Fantasy Grounds, Roll20, and more. Plus, like any Dungeon Master worth their salt, we have a few exciting surprises to pull from our bags of holding! You’ll have to watch the Stream of Annihilation to catch it all live! 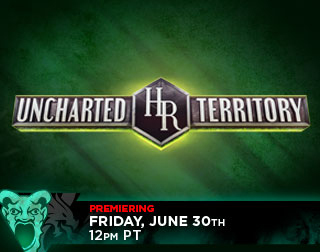 Follow twitch.tv/DnD to get all the updates, then mark your calendars for Friday, June 2nd and Saturday, June 3rd to make sure you don’t miss a thing! A full schedule, group bios and some more of the celebrities attending the Stream of Annihilation will be announced over the next few weeks. We’ll also be talking about the event on our official Twitter account (@Wizards_DnD) as well as interviewing some of the groups this month on Dragon Talk, the official D&D podcast. Anna Prosser Robinson is perhaps most often recognized as an on-camera personality specializing in gaming, esports, and other emerging new media content. You may have seen her hosting live shows or events for Twitch, or esports events for Blizzard, as well as appearing on live D&D shows like "Dice, Camera, Action" with Chris Perkins, or "Misscliks D&D." Anna also works full-time as Lead Producer at Twitch Studios, and heads up the “Twitch Inclusivity Group” - a grassroots organization of Twitch staffers across departments who work together to further inclusivity and diversity on Twitch as a platform and in the online gaming and content community. To that same end, Anna is the co-founder of Misscliks, a live streaming network and online community dedicated to "uplifting geeks and gamers." You can follow her adventures on Twitter and just about everywhere else under the username "AnnaProsser." Born from a family of geeks and gamers, Kelly Link has spent the majority of her life absorbed into the world of gaming. Beginning at the age of five, when her parents first introduced her to Dungeons & Dragons, she knew gaming was meant to be a part of her life. 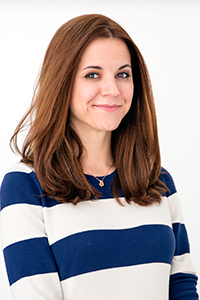 After graduating with a bachelors and a year of live streaming on Twitch.tv, Kelly was hired by HiRez Studios as a streamer, producer and host for their live and online programming. After three years she moved to Los Angeles and currently works for Cyber Solutions Agency, hosting and interviewing at some of the largest gaming events in the world such as Gamescom, RLCS Season 2 Finals and E3. 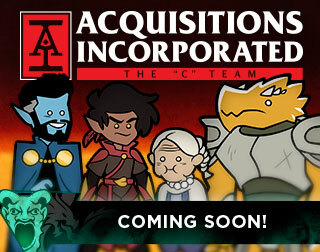 Acquisitions Incorporated: The "C" Team is the latest expansion of Penny Arcade's "Acquisitions Inc" comedy-tabletop franchise. Led by 9th level CEO Omin Dran (Jerry Holkins), these trusty adventurers are ready to climb the corporate ladder by facing the most terrifying and awe-inspiring sights of the Forgotten Realms. Streaming live on the Hyper RPG Twitch channel every Thursday at 3:30pm PDT. The HighRollers are a group of UK-based D&D Streamers, partnered with the YouTube gaming network The Yogscast. Mark Hulmes, voice-over and youtube creator, is the Dungeon Master and will be bringing his love for action/adventure movies to the gaming table for the Stream of Annihilation. 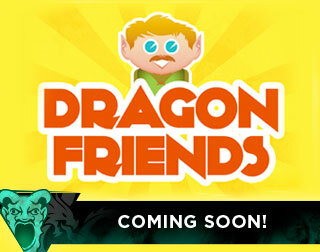 Dragon Friends is a show where a bunch of idiot Australian comedians muddle their way through a Dungeons & Dragons campaign. They’ve been doing it for almost two years now and you think they'd be better at it. Featuring David Harmon, Ben Jenkins, Edan Lacey, Simon Greiner, Alex Lee, Michael Hing and an assortment of our friends from comedy and sometimes even the telly. Accompanied with the live music and occasional snide comment by Benny Davis (The Axis of Awesome). 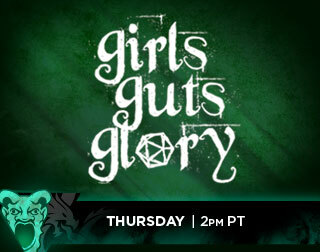 Girls Guts Glory is an all-female RPG group. Our main focus is having fun, playing D&D with our girlfriends. A lot of time is spent drinking wine, eating food and catching up before we even start playing. We're all actresses living in Los Angeles, so it's fun to be silly, improvise and play roles we'd never get to play in real life. I mean, who doesn't love shooting crossbows at a narcissistic ogre? 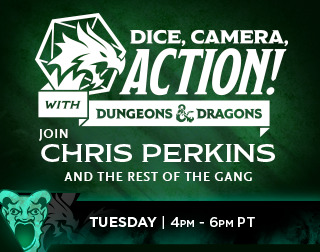 The D&D team, along with some friends from the YouTube and Twitch community, host an ongoing livestream of Dungeons & Dragons, titled Dice, Camera, Action! DCA is a live play-through of D&D’s latest storylines, run by Dungeon Master extraordinaire, Chris Perkins. 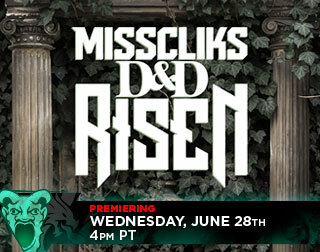 Misscliks D&D: Risen is a new show led by Dungeon Master Nadja Otikor (@trist_chi), who recently wrapped up her previous show Misscliks Prophecy. She’s joined by veteran players Kelly Link (@hellokellylink), Steven Lumpkin (@silent0siris), Brit Weisman (@britweisman) and Neal G Erickson (@koibu0). 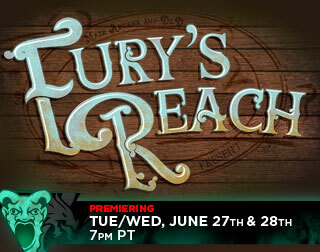 Join Maze Arcana, and their gallery of celebrity friends, as they set sail with Dungeons & Dragons after the same prize in Fury's Reach. Two groups in a shared timeline led by Dungeon Masters Satine Phoenix and Ruty Rutenberg will both be chasing after an artifact to further their own ends. Who will find it first? Dungeons & Dragons is also pleased to welcome the following special guests, including Matt Mercer, Joe Manganiello, Liam O’Brien, Marisha Ray, Matt Colville, Dylan Sprouse, Matthew Lillard, Abraham Rubin Hercules Benrubi, and TrumpSC!